We were pretty impressed with all the truck lighting at SEMA and since the lights looked so good on the monster trucks, we are going to show you some of the coolest truck lights at SEMA. Of course everyone would notice a raised monster truck, but the ones we saw are so aggressive and badass that we just zoned in on all the crazy upgrades and lights. 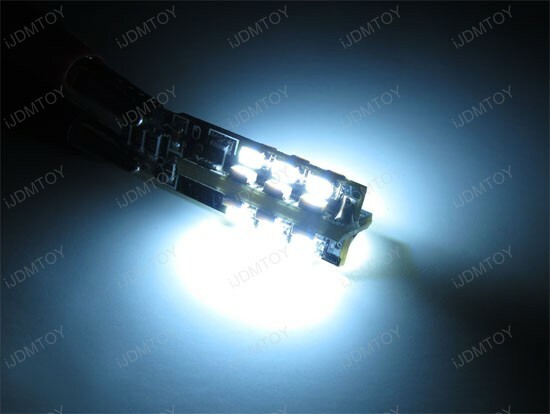 This LED truck light apparatus looks like it’s good for daytime running lights, driving lights, search lights, and all kinds of functions. All trucks should have these kinds of heavy duty LED lighting assembly since you never know when you would need some work lights or off-road lighting at a moment’s notice. You could install a smaller apparatus or a full on bar depending on preference. These trucks at SEMA have everything installed so it looks like you can never have too much lights! 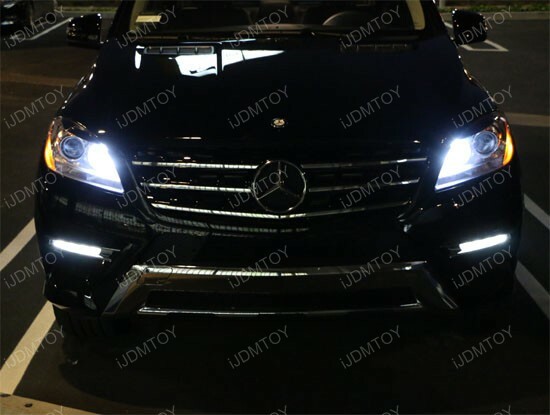 Here at iJDMTOY, we recently installed a pair of parking lights on a 2013 Mercedes ML 350 to test out the new product and the results are nothing short of spectacular. 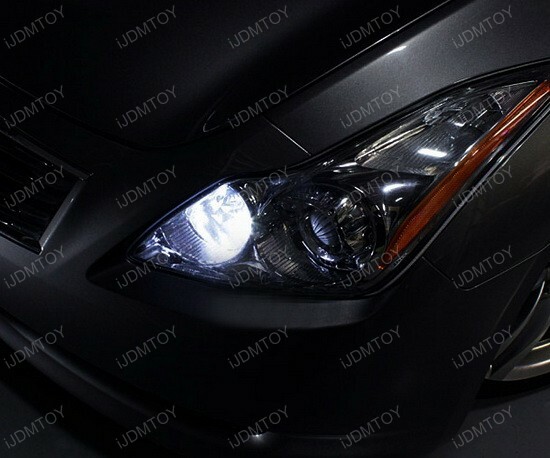 These new LED Parking Lights are a sure fire way to get plenty of attention on the road. The parking lights are the small miniature lights that are also on with the low beam headlights at night, they serve as lights to be left on while parking (hence the name) and to provide positioning details of the car in the case of the headlight burning out. While they serve the same purpose one every vehicle, the names may differ from make to make; for example the Mercedes-Benz vehicles has them positioned on top of the headlights so it is called an “eyelid light”. Normally, these are regular incandescent halogen bulbs so they produce a yellow glow. 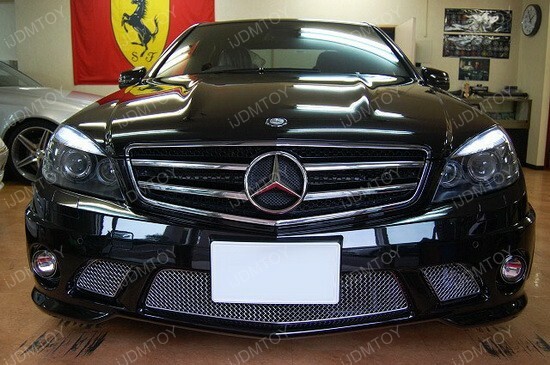 This is an eye sore; especially for a Mercedes that comes with factory HID headlights which are bright white. Our LED replacement bulbs for the eyelids are the perfect solution to this problem. 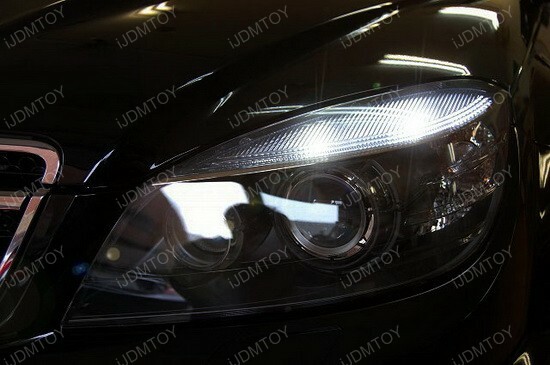 The Mercedes W204 LED eyelid lights we carry are 100% plug and play so no modification is required for installation. 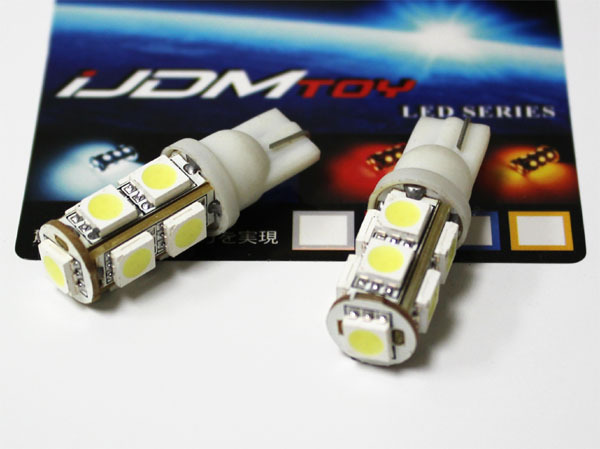 The factory size for this W204 C63 AMG is a W5W, otherwise known as 2825/168/194; our 24-SMD 1210 T10 LED Replacement Bulbs are the perfect choice for this application. While these bulbs are slightly longer than the factory bulb so they may not fit in every housing, they fit perfectly in this Mercedes-Benz. 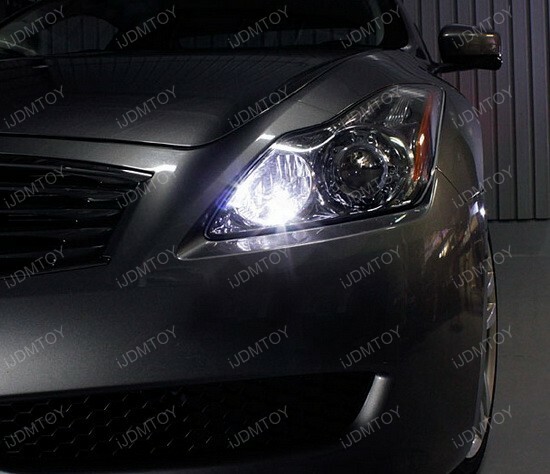 These error free LED eyelid lights are very easy to install and works for many other Mercedes-Benz vehicles such as the 2005 E500, 2006 SLK350, and 2008 CLS500. The built-in resistors on the LED bulb make these error free so they do not flicker or cause any error messages to appear on the dash to state that the bulb has burned out. 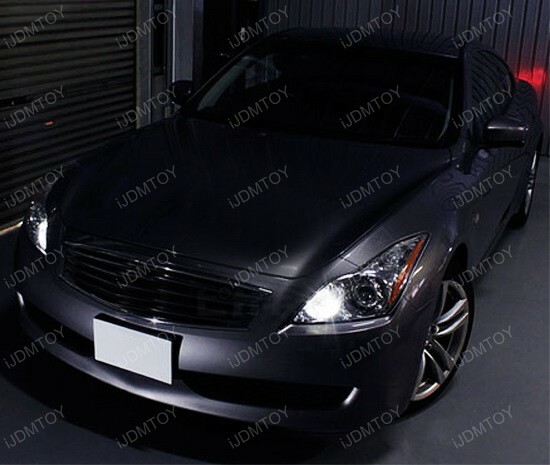 The color is 6000K Xenon White so it is a perfect match for many of our other LED light. While these were tested on a Mercedes-Benz C63 AMG, it should also work for many other vehicles that can fit this and require error free bulbs. At 1.43” in length, these are about 1” longer than the traditional T10 bulb you would find on these vehicles so please make sure confirm these will inside the housing before purchasing. LED strips seem to be the recent craze in regards to automotive lighting modifications thanks to its ease of installation. 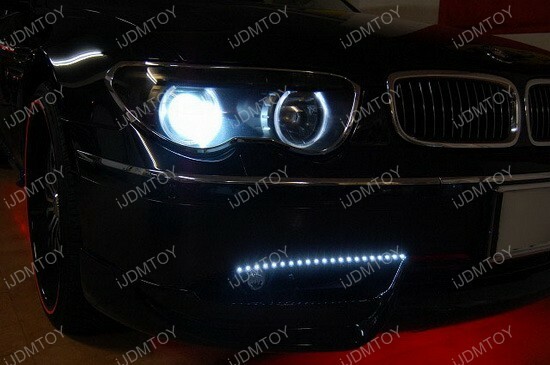 As long as there is enough room on the vehicle, these LED strips can be fitted with some slight work. Our LED strip lights are all universal and do not have a specific application; we provide measurements of how long they are so that the customer can measure their application prior to installation to make sure it fits. 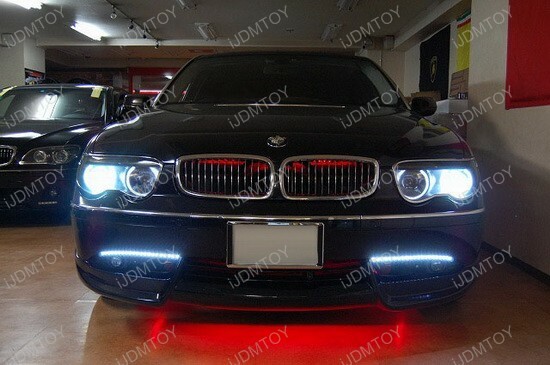 On this 2003 BMW 7-series, the customer decided to install the LED strips right above the fog light on the flat area. 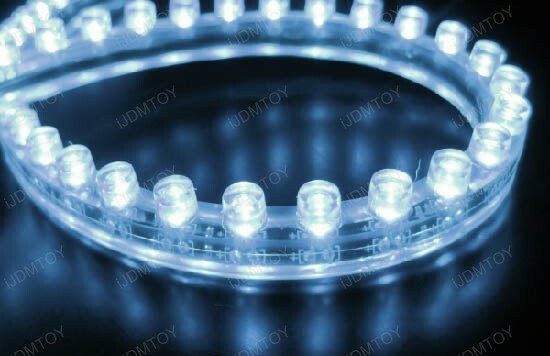 This particular LED strip did not come with adhesive tape unlike our other styles so for installation, you need to supply your own adhesive tape or use silicone epoxy to bond the strip to the vehicle. There are two wires that power up these 20” 48-LED strips which are connected to any power source you would like the strip to be on with such as your parking lights for running lights or 12v ACC+ wire to act as an LED daytime light strip; the possibilities are almost endless. The LED strip is also flexible s it can conform to unique shapes; on this 745Li, the outside edge slopes down slightly and can be compensated for by bending the strip.